Artist's concept of the ARES Mars airplane flying over Mars. U.S. engineers have long wanted to fold up an airplaneinside a rocket and send it on a mission to cruise through the atmosphere ofMars. They now have a new potential customer for the concept: the Pentagon'sDefense Advanced Research Projects Agency (DARPA). DARPA started a programearlier this year called Rapid Eye to demonstrate technology that would lead todevelopment of a rocket-delivered unmanned plane to fly high over the site of anatural disaster or other "hot spot." The idea is to give the U.S. president a first, quick look at the scene, DARPA Director Tony Tethersaid, following his talk at the Geoint 2007 Symposium in San Antonio. "We got this ideafrom NASA," Tether said. Engineers from NASA's Ames Research Center in California and Langley Research Center in Virginia, who are working oncompeting concepts for "planetary aircraft," began speaking withDARPA officials earlier this year about adapting some of their concepts forneeds on Earth. 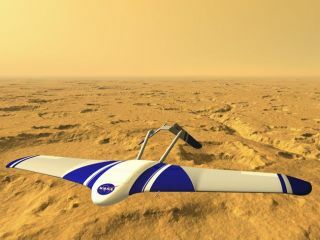 Since the 1970s asuccession of NASA engineers and scientists have dreamed about flying an unmannedairplane over the surface of Mars to take close-up photos and make othermeasurements. Dale Reed, a researcher at NASA's Dryden Flight Research Center, Edwards, Calif., who died in 2005, earned a patent in 1977 on his design for afoldable Mars airplane called the Mini-Sniffer. In 1999, then-NASAAdministrator Dan Goldin revived the dormant idea by challenging NASA to fly aplane over Mars in time for the centennial of the Wright Brothers flight in2003. Joel Levine of Langley twice proposed missions to deliver an airplane toMars. None of those proposalsleft the ground because of a combination of budget, scientific and technicalchallenges. Engineers at Ames and Langley have continued to work on theirdesigns in wind tunnels and in high-altitude tests, and today the idea offolding a plane inside a rocket and deploying it once it reaches Mars no longerseems as technically radical as it once did. "I think there'sactually relative agreement now that it's technically feasible and not terriblyrisky," said Larry Lemke, a mission designer at Ames. Tether agreed. "There'sno reason why we can't do this," he said. NASA might have inspiredthe idea, but DARPA has decided to approach the U.S. aerospace industry firstthrough its Broad Agency Announcement process. That has led some NASA engineersto wonder whether or how they might be able participate. "They will beinvolved," Tether said of NASA engineers. "But we're going out on ournormal process of a broad agency announcement to industry [saying] that we wantthis capability." On Mars, the airplanesthat have been proposed would fly in the thin martian atmosphere at altitudesbetween 5,000 to 10,000 feet (1,524 meters to 3,048 meters). On Earth, thatwould be the equivalent of flying at 100,000 feet (30,480 meters), a perfectaltitude for surveillance, Tether said. The concept of usingrockets to deploy sensors as rapidly as possible to any hot spot throughout theworld also is a goal of the U.S. Air Force's Operationally Responsive Spaceinitiative. "We didn't have thatin mind," Tether said, noting that DARPA's concept for Rapid Eye is tosupport "the president." Nevertheless, the same concept could be usedto support military personnel in the field, Tether said. In a real world scenario,an unmanned Rapid Eye system would provide quick surveillance until othersensors could be trained on the scene. Those could include sensors aboard thenew Ultra Long Endurance Aircraft DARPA is designing, Tether said. Those craft would be slowflying but they would able to stay aloft for up to five years and would besupported by an autonomous refueling system DARPA is developing, Tether said. "It sounds funny,but imagine if we could do that. Who needs satellites?" he said. A description of theprogram published in July said the goal of Rapid Eye is to develop ahigh-altitude, long-endurance, unmannedaircraft that can be rocket-deployed from the continental United Statesworldwide within one to two hours to perform intelligence, surveillance,reconnaissance, and communication missions. The enabling technologieslisted included inflatable, folding structures, stable and dense energystorage, and low-oxygen propulsion.